Watching the skies is much more than a hobby with the Marshall Center’s Bill Cooke, lead of the Meteoroid Environment office — it’s an obsession. Each morning when Cooke logs on to his computer, he quickly checks email for the daily update from the fireball camera network. Groups of smart cameras in Cooke’s new Fireball network triangulate the fireballs’ paths, and generate the report that appears in his email each morning. 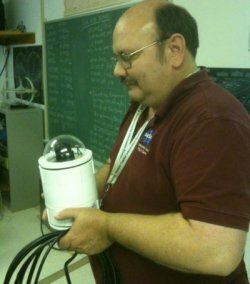 Cooke’s network of cameras is currently made up of three cameras; however he is looking to add 12 additional cameras, and he’s actively seeking schools, science centers and planetariums to host his cameras. The cameras will need to be deployed in clusters of five. One group will be spread over the southeast United States; another in the Ohio and Kentucky area; and another along the Atlantic coast in the northeast. The hope is that at least one of the three regions will have clear skies at any given time. Stay tuned for details on what the fireball network reports! I love the work you do, make approximately one month in the skies of Barcelona, about 13:00 I saw a flash in the sky falling, and as taxes on the road breaking desaaparecer hata. I wish I could help find the cause of space equipment breaking down, and I think that in Spain you have any kind of telescope to monitor this. If I can help here to make it possible to place these telescopes too, have my help. Regards, and enhorabuen for your work. Would appreciate reading more about the fireball network…software, cameras, possible growth into the western USA, etc. 3201 Teakwood Drive, Coopersburg, PA 18036. I am a realtor and have access to 28 counties of public records in PA,NJ and Maryland. Mike Hankey has used my access to public records to send out post cards to try and get the public involved to help find the Mason Dixon Meteorite. I have a 2 story home with 9ft ceilings and steep peeks. I can send you photos of my house location and willing to upgrade my internet speed if necessary. Let me know if you have any need/interest. I was going to hook up a mini network with Mike using UFO capture program but was waiting to see if his setup is working 1st. I own a dozen or so meteorites (bought not found) and have been searching in Lancaster for the Mason Dixon fall. I want to get more involved.